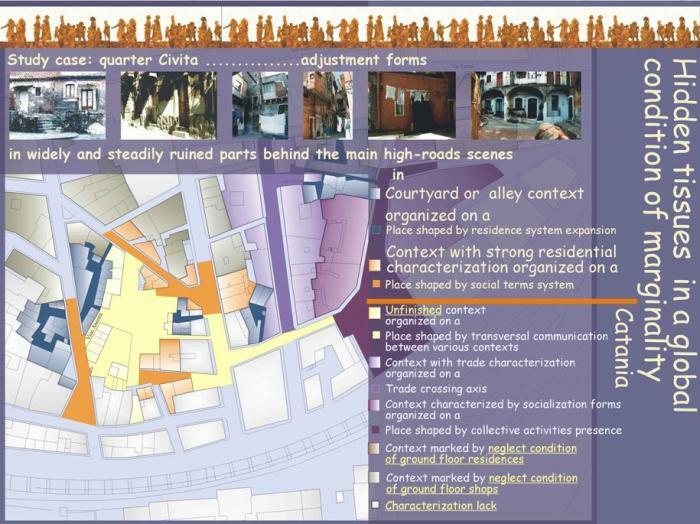 Also in Catania immigration phenomenon has assumed such proportions that the social morphology of certain areas in the historical centre has changed deeply, becoming entirely also a matter of city reorganization. Indeed the metamorphosis of its people composition has deep repercussion on the use of public spaces that inscribe themselves in different logics from those that structure welcome society. From an objective analysis, through collection and study of statistical data and widespread inspections, aimed to document immigrants distribution, value their residence policies and inclusion modality, it emerged that immigration is genereting use procedures and real estate "risignification" in advanced decay, even though mainteining unchanged residential purpose. Indeed the different degree of visibility in public spaces, habits of residence use, different daily rhytm of life add to, sometimes replace, coded images of a life style that our society believes as the most acceptable. Plot between immigration and public spaces transformation is evident in the strenght by which these people, even though leaving weak marks on material spaces, are using some historical public spaces of the city. Moreover it is important to note the construction of cult spaces and geography of associations places which often presents a stronger permanence than same residence and make these places central for a wider popolation of immigrants, creating trouble to local people. The host society has a static and clearly defined set of social structures and values on wich immigrants presence has an impact, if not of hostility, conflict or intolerance, at least of anxiety. The use of administrative practices, involving together old and new citizens, could favour the acceptance of this new-born reality, could invert from the start of the formation of opposition phenomenon. 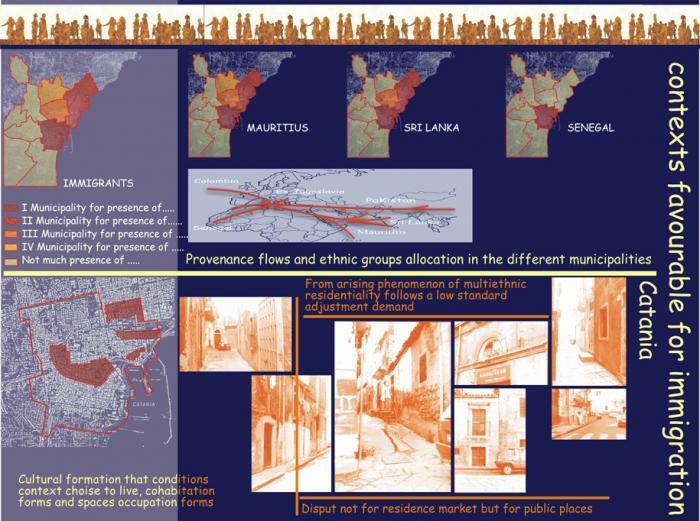 If the use of public spaces could be contended with autochthonal people, it is not true for residence market: a substantial flow of immigrants is replacing local people in the more modest residences, in some hidden areas of the historical urban tissue.